We rented a tandem (€35) from MacBike and rode up to take the ferry across the Ij. Our route took us alongside canals, through parks and occasionally on public roads. First stop was Broek in Waterland. 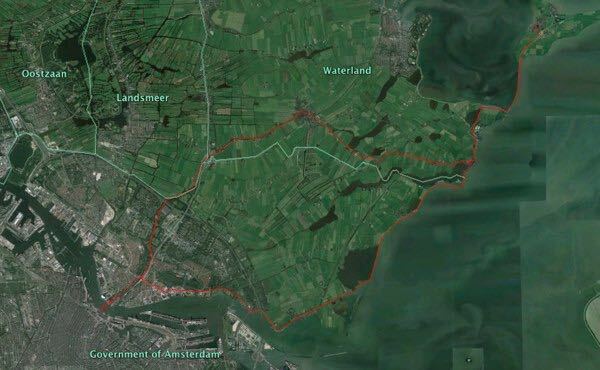 Then we cycled east to Uitdam and on up across a causeway to the island of Marken. There is a lovely little harbour at Marken. Completely sheltered and if there is space one can moor alongside for up to three days free of charge. We had the wind behind us on the way up. Sadly our tandem proved unsuitable for long trips and Nan took a bus back. We returned along the edge of the Ijsselmeer via a track along the restraining dikes. We passed through Durgerdam and stopped for a drink at Grote Haven alongside an extensive marina tucked away off the Ij. All told we covered about 50k. I would not recommend MacBike or a tandem. Better to pay a tad more for a good bicycle with proper gears.